InSpirit Aesthetics by Mary Canel, Board Certified Nurse Practitioner in Wilmington, NC is your partner in aesthetics and sexual health. You can enjoy complete peace of mind knowing that your most private and personal concerns will be managed with great care and sensitivity by a highly trained health care professional. Read on to learn more about Mary Canel and what differentiates her from other aesthetic and health care professionals. Mary treats all of our clients with respect for their individuality. She takes the time to personalize her approach, and collaborates with each person to discover therapeutic interventions suited to their unique needs. Mary is passionate about what she does, and it shows in the quality of her work. Mary delights in working with her clients to achieve their desired aesthetic and health goals. 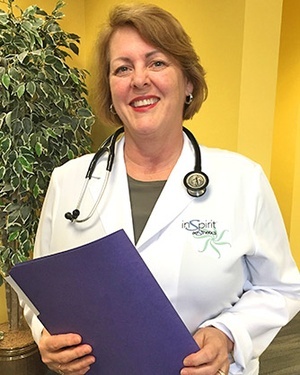 Mary Canel, a Registered Nurse since 1982, received national certification as an Adult Nurse Practitioner with a Master of Science in Nursing degree from the University of Texas Health Science Center in Houston in 1992. Specialized in both Women’s Health and Men’s Health in the graduate program while employed as a Clinical Cancer Detection Specialist at MD Anderson Cancer Center, Mary enjoyed teaching physicians and nurses about cancer prevention and early detection. She received consistent recognition as an excellent health care team member in the treatment of Gynecological, Breast, and Urological cancers at the internationally and nationally recognized research center.